Are you thinking of fencing in your home in the Nashville, Brentwood, or Franklin area? Franklin Fence and Deck has been in business for over 28 years. We specialize in aluminum fencing but we also build custom wood, vinyl, chain link, farm fencing, wrought iron and commercial fences. Not only do we specialize in fencing, we also customize decks, arbors, gazebos, and screened porches for your home. We have all the fence and deck basics, as well as customizable options! At Franklin Fence and Deck we guarantee our deck work against both time and elements! We truly care about our customers and it shows with our repeat business and referrals. Along with our outstanding reviews, Angie’s List awarded us with the distinct Super Service Award in 2012. Can’t decide between an iron and aluminum fence for your home? Are you considering adding on to your backyard with a beautiful wooden deck? Did you know that by building a wonderful wooden deck or adding an elegant aluminum fence to your property, you are adding value to your home? Give us a call and we will gladly come out to your home and go over your options! 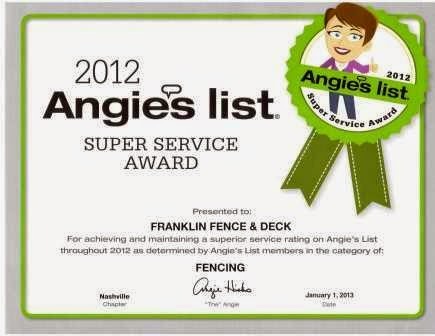 Franklin Fence and Deck has proudly been servicing the Nashville, Brentwood, Franklin, and surrounding areas since 1984. You can contact us via phone at 615-790-8428 or e-mail us at franklinfence@yahoo.com. Make sure to check out our special offers!